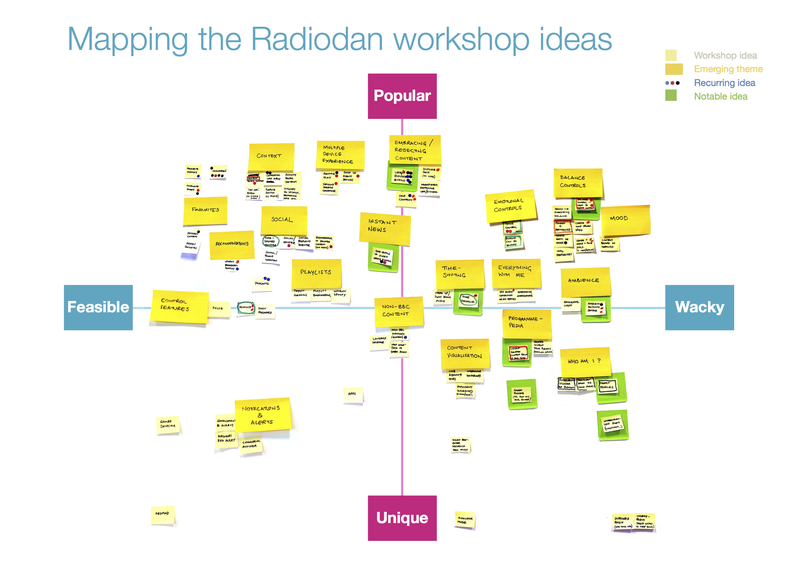 As I explained in the previous post, using the Radiodan postcards, we persuaded people to talk about what they wanted their radios to do. 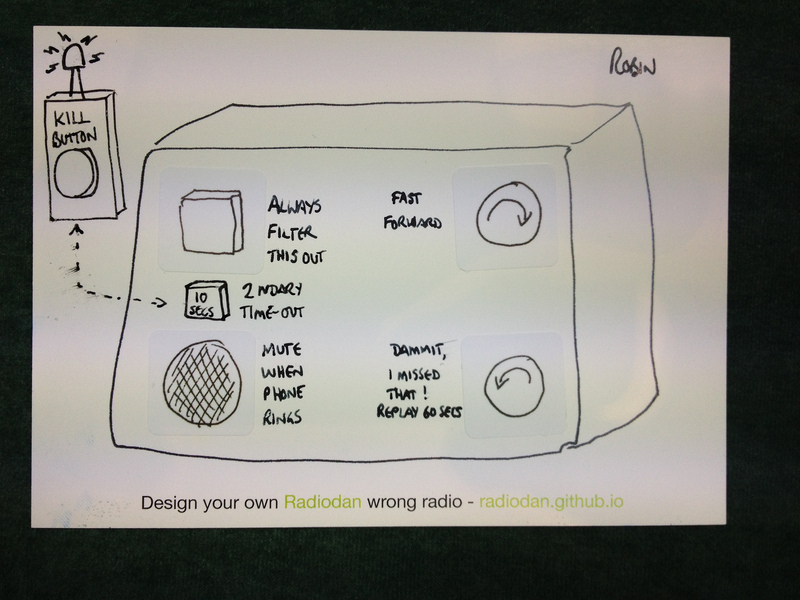 The process was asking them to customise a simple sketch of a radio by drawing and writing on it and by adding stickers representing buttons, dials and lights, in answer to the question “what would your radio do?”. Novelty was high over the collection of cards, evidenced by our colleagues, unprompted, designating one dimension of their analysis of the cards “wacky“. Diversity was also high. Themes emerged, but they were on quite different dimensions. I think the postcards may be a technique for cheaply identifying some kinds of “latent user needs” (the things people don’t know they want, or don’t ask for). Product owners in companies often rely on their own intuitions and experiences to uncover their own latent needs. This is easy and cheap, but subject to groupthink (the sort of process that leads to business models like “I need X and all my friends do, therefore lots of other people will”). An alternative route to discovering what you don’t know is to undertake ethnographic studies, such as diary studies or observational studies where you video or otherwise record current behaviour in situ and then analyse the results. The extent of use of these is limited by the significant expense, time and expertise required. Getting people to draw postcards is obviously far less informative than a proper ethnographic study (or an in-depth interview), but it’s very fast and cheap, so you can ask more people about their experiences and so reach different kinds of people. It also has some nice inklings of Participatory or Co-Design where people start to become actively part of product design. To extrapolate it to other devices or areas I need to work out why it worked. I’m neither a usability researcher nor a psychologist, so I’d very much welcome comments from those with greater expertise. The first was the way we structured the conversation to use the present to think about the future. I’ve started noticing a great deal of this since I saw Matt Novak give a talk called “A Brief History of Tomorrow” at dConstruct 2015. 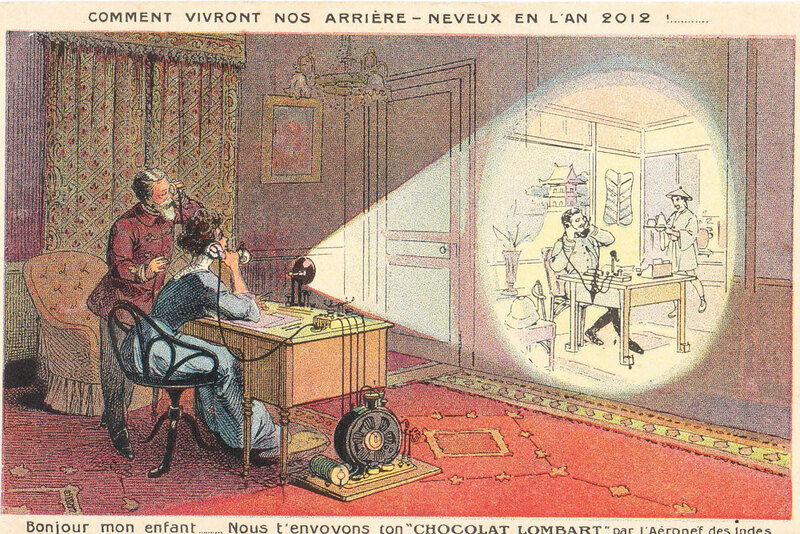 He argued that the future is always envisioned using the current technologies, for example by a video phone from the 1900s illustrated as a combination of a static telephone and projector. The new idea is there, superimposed on the objects of that time. The loveliest and most radical example I’ve come across was the leap of abstraction made by Charles Babbage and Ada Lovelace to reimagine the punch-card-based Jacquard loom as a computer. Just because someone can make that jump to the future based on objects present doesn’t mean they will, but nevertheless if you start with a thing that is well-understood and familiar, you may be able to get people to extrapolate the future they want from it[*]. The second reason relates to a form of prototyping known as ‘pretotyping‘ – cheaply understanding how you might use an object by pretending it already exists. Famously, Jeff Hawkins carried around a suitably-sized piece of wood to give himself a physical intuition about what it would be like to own and use a Palm Pilot, before building a more expensive working prototype. My unproven suspicion with the postcards is that just thinking about and drawing objects engages your physical intuitions in a similar way, giving authentic insights into the role that object plays in your life. If I’m right about these two reasons, then the novelty and diversity we found comes from the diversity of the people that we talked to, and the differences in how their lives bump into radio. This makes the cards excellent starting points for exploring Richard Pope’s multi-dimensional version of Productland. In Part 3 I’ll talk about the physical prototypes we made, really this time. [*] In the radio case, this all falls down when you talk to children, who don’t tend to listen to radio at all. This entry was posted in Uncategorized on November 10, 2015 by libbymiller.